After two albums on LMP "Twilight of Humanity" 2002 and "Vengeance Rising" 2006, Zandelle released their latest album on Pure Steel Records "Flames of Rage" in 2008. 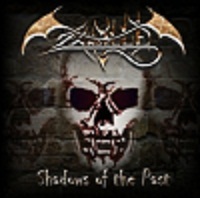 But before those three albums they have released two albums independently: "Zandelle" in 1996 and "Shadows of Reality" in 1998, and ten of the songs from those two albums are being re-released here on "Shadows of the Past". "Shadows of the Past" comes as a double disc, the first one with four tunes from "Zandelle" and six tunes from "Shadows of Reality" all re-recorded. There is also three bonus tracks "Unleased", a left over from the "Vengeance Rising" album, "Scream My Name" a brand new song and "Bad Boys" a Whitesnake cover. The second disc has the first ten tracks from disc one, but in their original form from 1996 and 1998. Well I got the two independent albums and was listening to them a couple of times the other day, and they don't sound outdated at all, but I have to admit that the re-recorded versions are a totally killer. Here you get some good US power metal, so all of you US metal fans out there; this is a must have for your collection. And Zandelle please release a new regular album soon.